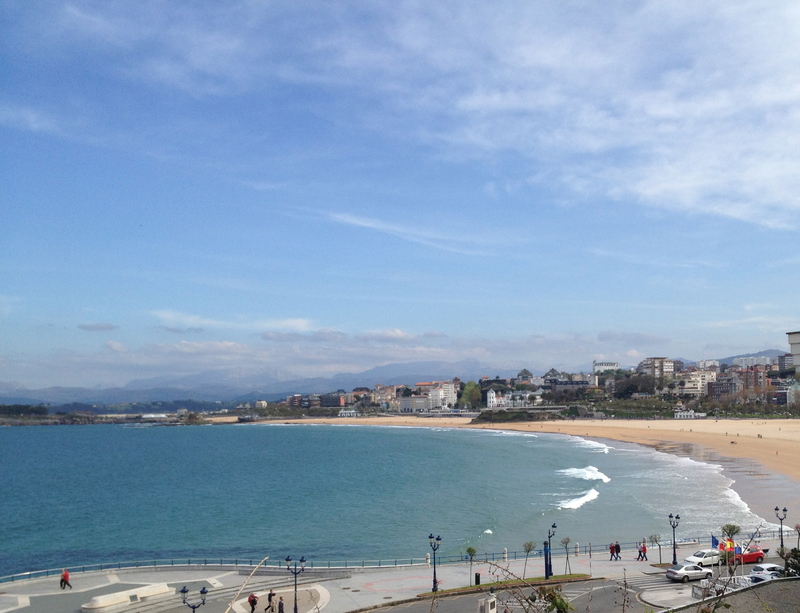 Being a peninsula, Santander is spoiled for coastline and whenever I get a free hour or two I like to walk on the beach. 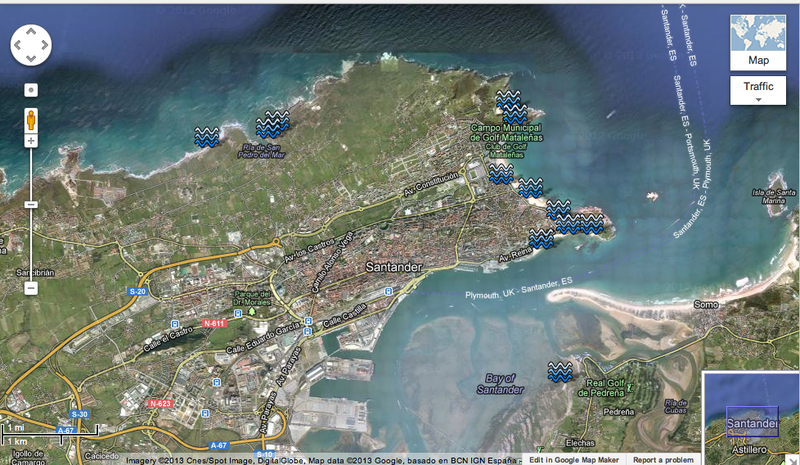 Last Sunday I decided to see how many beaches I could take in. I managed nine within my two-hour walk going at a steady pace. 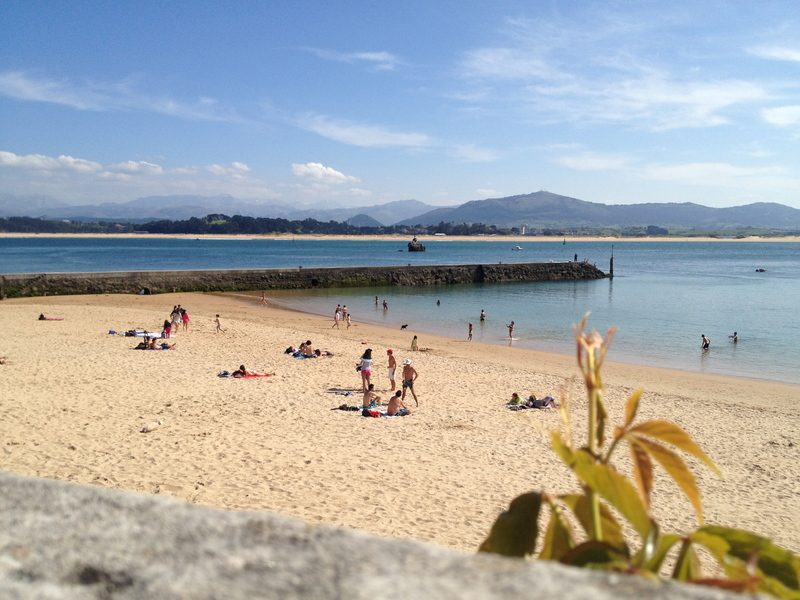 There are another three or four within the city of Santander – but they’re not accessible along the coast – you have to go back into town again. On the offchance that there are a few more souls like myself that might be interested in walking beaches rather than lying on them – I’ve documented where I went. It’s a good route for anybody who wants a good walk – or somebody who wants to see the peninsula from a number of different angles. It’s probably a bit ambitious in the warmth of July or August but you could also slow down the pace and take an hour at each beach or even a day – if you have the time. You can start at the large and easy to find Palacio de Festivales building in Puerto Chico harbour but I was pushed for time and was coming from the far side of the city so I hopped off a no.1 bus at Gonzalez de Riancho bus stop on Avenida Reina Vitoria – and took the steps down to beach number one – Los Peligros. And then I just followed the coast all the way round to the Magdalena and Los Bikinis – then looped back to the Camello, the Concha and the Sardineros – and finally took the beautiful coastal paths (with steps) around the head to the Molinuco and finally to Mataleñas and the end of the track by the lighthouse. Maybe it was because it was the last beach on my mini-tour but Mataleñas was really beautiful. I’ve only been a handful of times and I’m going to change that this year. 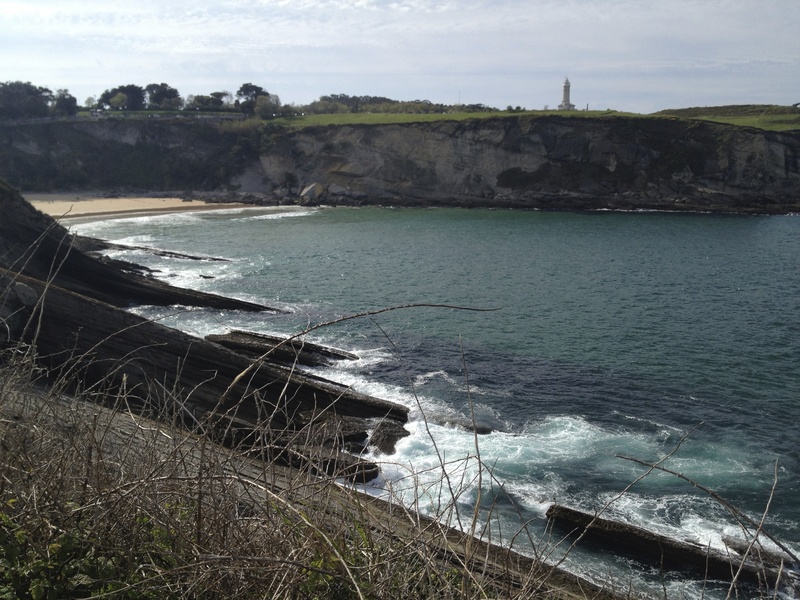 From here I walked back down through the park rather than on the coast to the Sardinero beaches – but there is a number 15 bus that will take you to the centre if you’ve had enough. The beach I visit most is probably La Magdalena/Los Bikinis. It’s on the grounds of the Magdalena Palace that was the Spanish royal summer residence a century ago. 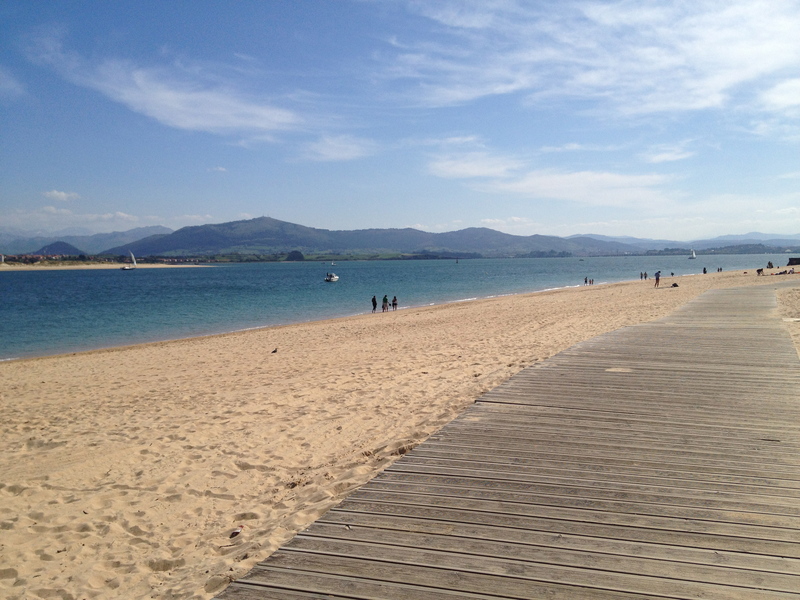 I come to this beach all year around because not only does it have a great playground and a large slide down onto the beach plus a handy cafe in the UIMP buildings, but the views of the mountain ranges on the other side of the bay are always amazing – especially in Winter when the peaks are snow-capped. Of course, if I were to recommend beaches for swimming rather than walking past – I’d recommend one of the Sardineros or even El Camello – for its waves and a sense of the open sea – although last Sunday it wasn’t particularly wavy – but it does fill up with body-boarders and surfers when the conditions are favourable. And if we are talking gluttony, you might have seen the corner of the Balneario Bar & Restaurant on Playa de la Magdalena in the video – which is a great place for a coffee or a drink on a sunny day. And when it’s turned cold outside – get to BNS Bar & Restaurant – also in the video – on La Concha beach which has a glass wall looking on the bay. You get to see the hardy swimmers that brave the waves every day of the year and have a beer or a glass of wine whilst doing so. This place is very family-friendly so we often have something to eat here if we are all out for the day. Do you like my walk?